A flurry of activity greets you as you drive around Santa Rosa’s Coffey Park neighborhood — a stark contrast from October 2017. A year after the most destructive wildfire in California history burned down parts of Napa, Sonoma and Lake counties, the neighborhood continues to rebuild. These photos and videos show the aftermath of the deadly wildfires and what some of the streets — made famous in iconic aerial photos and video — look like now. This house next to Coffey Park residents Hugo and Patty Aguirre was completely gutted in the fires. However, the rose bushes on the property miraculously survived. 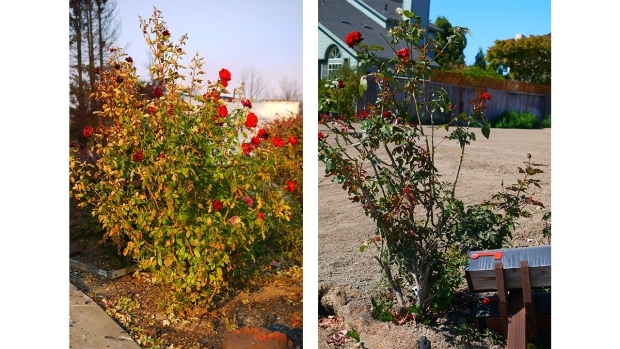 The Aguirres said the owner was determined to keep the roses alive even during the rebuilding process, and even came out regularly to Coffey Park to water them herself. Construction crews — a mix of locals and migrant workers — are busy cleaning, building and mixing cement. Sometimes the temperature surpasses 90 degrees in Sonoma County, but the work never stops. Some of them waved at NBC Bay Area as we flew our drone over the houses.